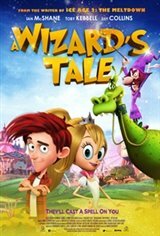 A WIZARD'S TALE is a magical family adventure story that sees a young kid named Terry (Kebbell) whisked away to the colorful Kingdom of Groovynham. The evil wizard Grump (McShane) has cast a spell of gloom over the land and as such, smiling & laughter are now a thing of the past. Terry must travel the Kingdom in search of a spell that will help get everyone's happy back and along the way help Princess Dawn (Collins), outwit all manner of strange & wonderful creatures, and try an embrace a little thing called "change."